The only DE I planned to participate in during 2018 was the Indy DE. After studying my 2017 videos, I had several changes planned for this year – straightening out the esses (T5-6 and T8-9) as well as going deeper into T11 and T14. The biggest change planned was to not downshift to 2nd in T1, T7, and T12. I have a bit of a synchro issue with 2nd gear, so I wanted to save it as much as possible. I ran a couple of sessions last year not downshifting to 2nd and it worked well except for T12. I might have to give up some speed doing this, but that’s worth it to save my trans. I was ready to go and even had the proper dates circled on my calendar. Some pre-DE emails arrive with garage assignments (Gran Prix garages again this year). And they made changes to the course – they pulled up the curbing in T7 and made it into a sweeper, and opened up the Gran Prix section of T5-T5A-T6A instead of the esses of T5-T6. This latter change made the exit of T4 different along with figuring out the proper lines for the new corners. I would remain in the 3rd run group, which allowed open passing. 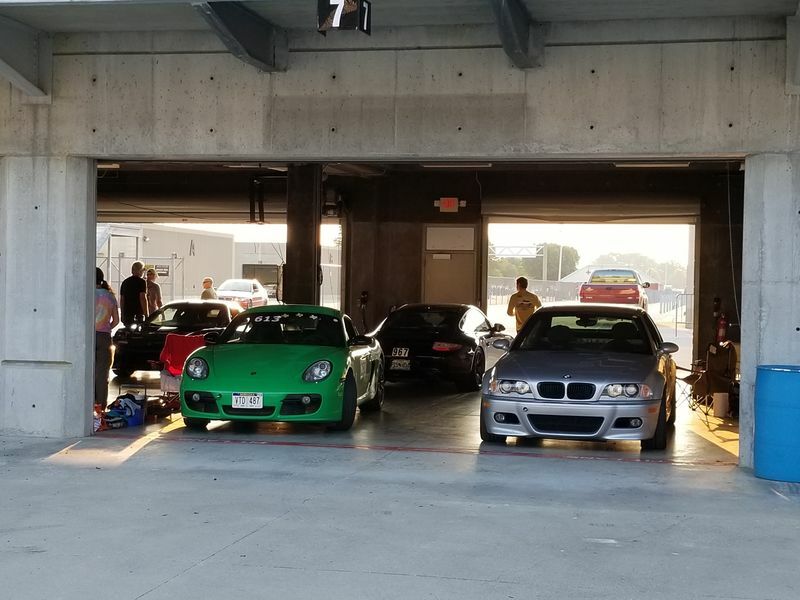 Thankfully the Miatas were missing this year, replaced by a bunch of BMWs. I arrived at Indy late Thu afternoon and got registered and teched. Fri morning I arrived at the track in a much calmer state than last year. Nothing unusual in the Driver’s Meeting, but they said they’d be watching the cameras in the Video Center to see how we figured out the new turns. My 1st session arrives and there aren’t a lot of cars gridded up – probably 25. We’re released and do the 1st lap under caution. Good time to practice the new lines. The exit of T4 now takes you completely to track out. T5 is fairly quick (kind of like T3 at MPH Hastings). T5A is similar to T2 at Laguna Seca, so I used that same line. There are 2 trees at the end of the turn that I used for my turn-in point – initially I used just past the 1st tree but switched to the 2nd tree as I gained experience. T6 was hard to find the apex as there were not a lot of features to locate as markers. It turns out there was a bright white gator that happened to be the apex, so I used that as my marker. T6 was important to get right as it spit you onto the back straight. The change in layout cost 20mph of speed at the end of the straight, so it was paramount to get the exit of T6 right. T7 was now much quicker as a sweeper and it sent you to T8 at a higher speed. I was able to straighten out the T8-T9 esses and was much faster there than previous years. T12 was no problem in 3rd and T1 wasn’t either and the higher gear actually improved my speed thru T2. By the end of Fri, I felt I had everything figured out, it was just a matter of getting clean laps (approx. 40 cars now gridding up) and hitting my marks. Sat morning I wanted to get a pic of my car under the Gasoline Alley sign and I figured getting there early would allow me to do so before activity picked up. I park to the right side of the sign and jumped out to take a quick pic before one of the Yellow Shirts (Indy track employee) asked me to move it. However, one of the Yellow Shirts asked me if I wanted him to take the pic. I said sure and he said I should center my car under the sign and proceeded to take 3 great shots of Sydney and I. He was the pre-grid master and said he loves my car and looked forward to seeing it each year. On Sat, one of my 12 garage mates talked his way up from the blue group into my white group. Blue was the fastest of the limited passing run groups but he said it was impossible to pass anyone. He ran the 1st Sat session in white and proceeded to chunk his left side tires (Mich 4Ss). 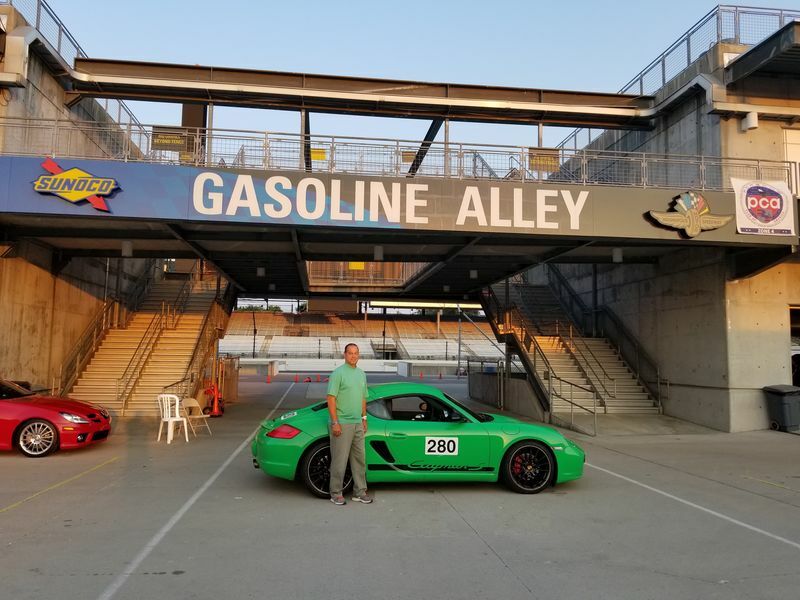 He was from the Indy area and called local shops + the Porsche dealership, but no one had the size for his Cayman GTS. I asked him how far South Bend was from Indy, since that’s where Tire Rack resides. He called them, they had his tires, so off he went. Got back and installed the tires and was able to drive the Parade Laps at the end of the day. He took it easy on Sun, but got to participate. It seemed the new sections were hard on everyone’s left side tires. I carefully watched mine but survived. Speaking of Parade Laps, cars were not jammed up this year so we got to go faster. We were supposed to go 35mph but hit speeds of 80 down the straights and 60 in the corners. Very sporty. And new this year was allowing the Yellow Shirts to do their own Parade Laps. Most of them had never been on the track, so it was nice to give them this opportunity. Always be nice to the Yellow Shirts. Sunday, the organizers did a neat thing for the blue group. To get the drivers ready to move up to an open passing group, the drivers were to do 2 caution laps to start the 1st session. They would drive side by side with another car the entire lap, then cross over on the main straight and do the 2nd caution lap on the other side of the car next to them. It was intended to give them a feel for sharing a corner with a car. Good idea. There were fewer cars in my run group on Sun, so I had more clean lap opportunities. I debated about running the last session or running it hard, but I’m glad I did both – I ended up cutting 1.2 sec off my personal best and tied my 2nd best time on another lap. Mission accomplished, time to reluctantly go home. All in all, a very good weekend. I felt like I was running good lines and was quick for stock brakes and street tires. I can’t wait for next year. Here are some pics from Indy. Yes, this is a GT2 RS. 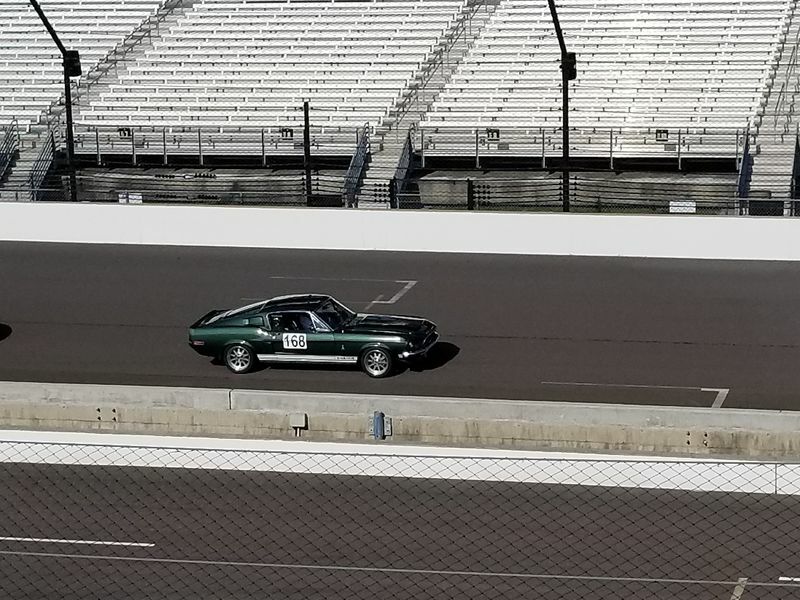 There was a Shelby GT at the track. Except it was a 1968, not a new one. Last edited by husker boxster; 08-15-2018 at 11:53 AM. This video has some cool passes at the 8:00 min mark. This one has clean laps. Set fastest time of the w/e on 3rd lap. After running a few more hot laps, I started to relax my pace. What happened to the ability to imbed videos? Last edited by husker boxster; 08-15-2018 at 11:52 AM. I saw the organizers of this event, the week prior, at the WeaherTech IMSA races at Road America. I worked the inaugural event for MORPCA back in 2015. I need to get back and work the grid and black-flag again in 2019. Great event. Very well run. Great attendees. If I had to guess, the GT2 RS owner was Mr. Valentine?????? Agree 100% that it's a great event and very well run. Didn't talk to the owner of the GT2, but he was older with glasses. He was running in the instructor / hot shoe group. Mike Valentine is older and wears glasses. He's the founder of Valentine Radar Detectors. Yes that is Mike V in the GT 2 RS. That looks like a lot of fun, I am going to get my first Roval/banking experience at Daytona this October.